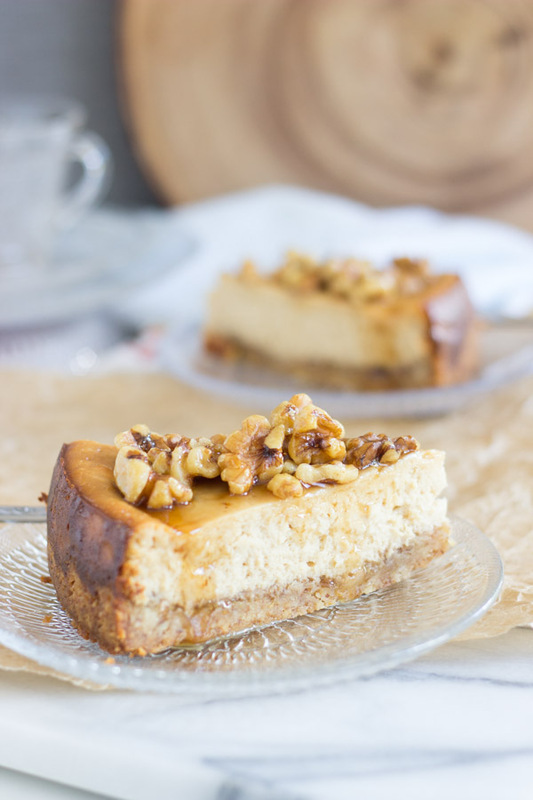 Creamy, rich maple cheesecake with a walnut shortbread crust, and a heaping maple-nut topping! 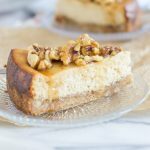 This Maple Nut Cheesecake with Walnut Crust is so rich and decadent, and it’s just what your fall needs! Good morning!! Oh wait, it’s afternoon. How did that happen? Well, S.O. heard good things about the new HBO series, Westworld, and we got sucked into a binge-watching session of it all morning. It is really good. 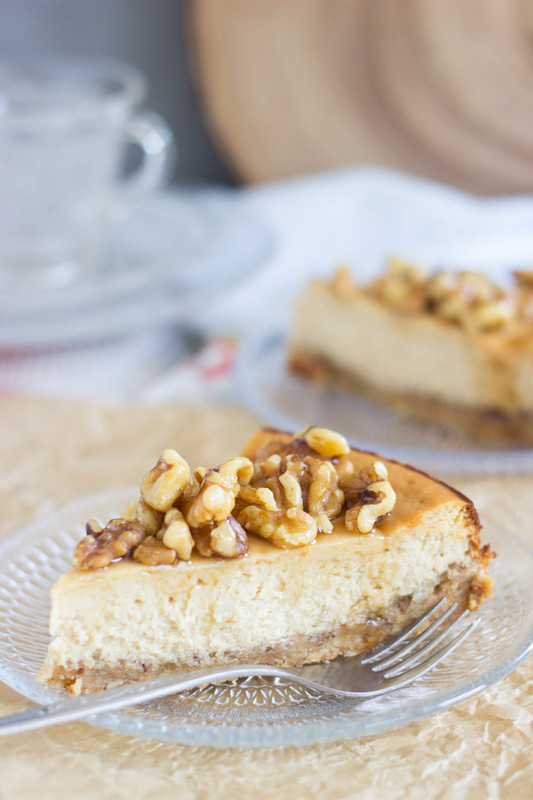 Also good: this Maple Nut Cheesecake with Walnut Crust. Had to throw that in there. Anyway, we started the pilot episode last night, but I couldn’t stay awake after blogging for a few hours (check out these Classic Sugar Cookies I posted yesterday) so we picked up where we left off this morning, and before you know it, it’s afternoon. What a strange show. Is anyone else watching it? I like it, but it’s weird. There is nothing about that world that appeals to me personally. It’s not my kind of theme park, that’s for sure. Before heading to bed last night, he wanted something sweet, and I had to dig around the freezer to see what I’d stuck in there. 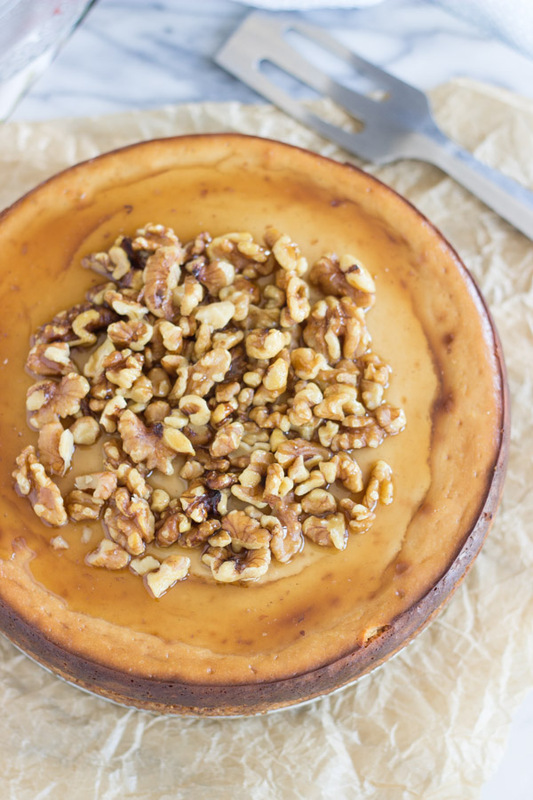 I found this Maple Nut Cheesecake with Walnut Crust, and this is the last of 5 cheesecakes I made for fall/winter. I don’t know how I forgot to share it, but I need you to know about it before Christmas because it is a good one. I couldn’t keep my eyes open, so I went straight to bed without having any. By morning, it was more than half gone. I’m not kidding. This isn’t totally uncommon in my house, but it still sometimes shocks me that half a cheesecake can disappear overnight. It happens though, and quite a lot. S.O. did that all by himself, of course. 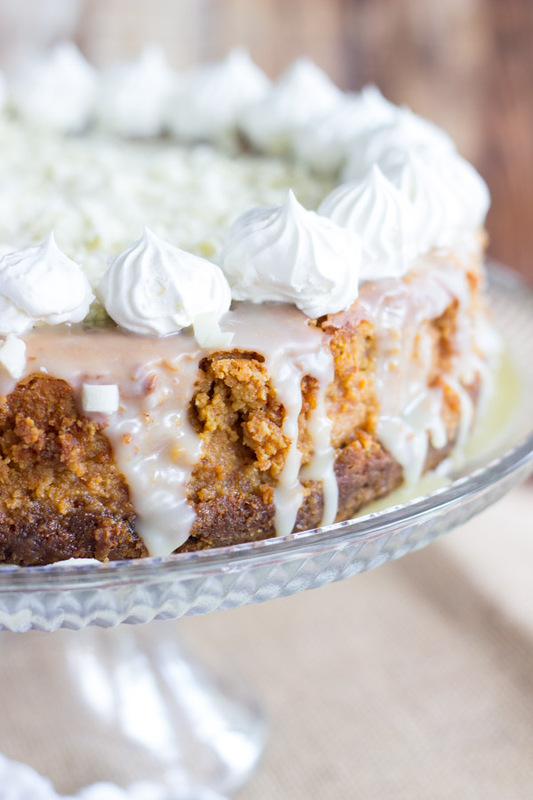 He said this Maple Nut Cheesecake rivals his love for my Double Layer Pumpkin Cheesecake, and that’s really saying something because my pumpkin cheesecake is probably his favorite food on the planet. 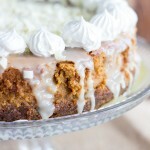 I had some for breakfast, and cheesecake for breakfast is pretty dynamite. 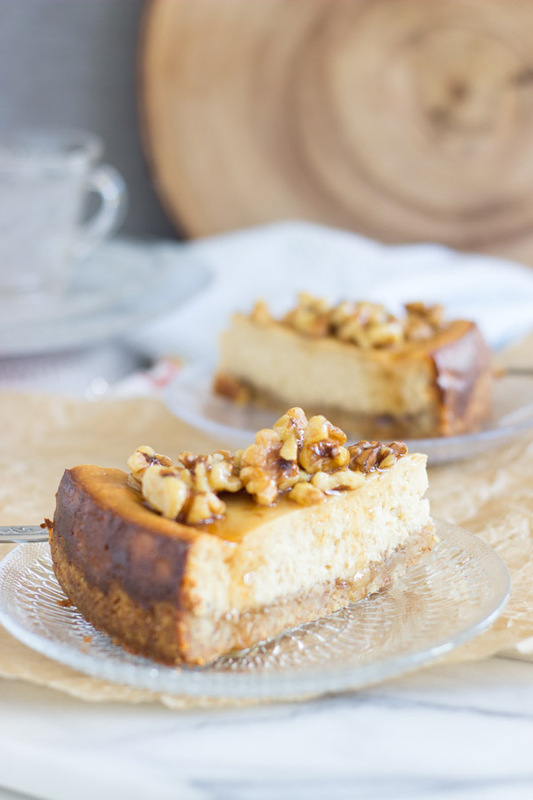 This Maple Nut Cheesecake really is wonderful. It was in the freezer with so many other things a few weeks ago that I forgot about it, but WOW, it is a fantastic cheesecake. 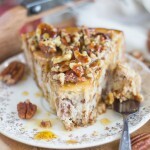 I am not even a huge maple person, but this is a damn good recipe, and maple and walnuts belong together. 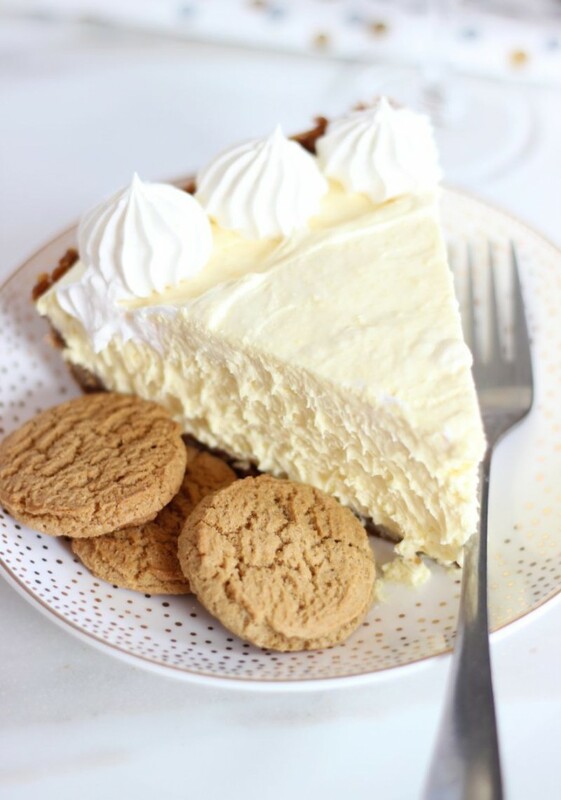 My favorite cheesecake crust, given any option, is shortbread. 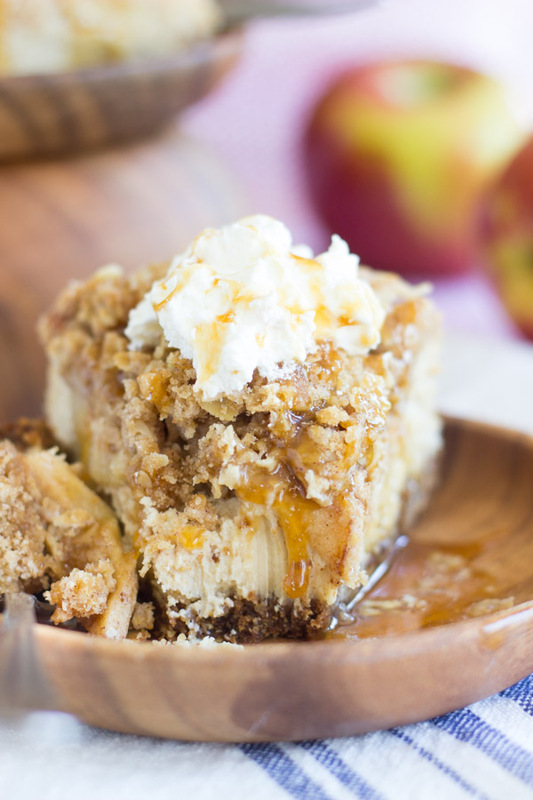 Buttery, sweet, crumbly, but soft, it’s the best. 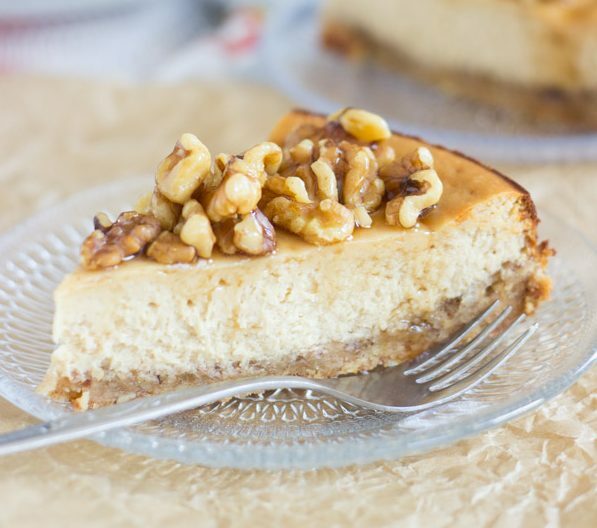 This shortbread crust also features finely minced walnuts, so you get nuttiness built right into the crust for this Maple Nut Cheesecake. The cheesecake layer has maple syrup right in the batter, but I always like things to have strong flavor, so I add maple extract too. I find this pretty easily, but it’s not necessary if you can’t locate it. 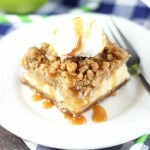 The cheesecake is sweetened with brown sugar, and let me tell you what a difference that makes. 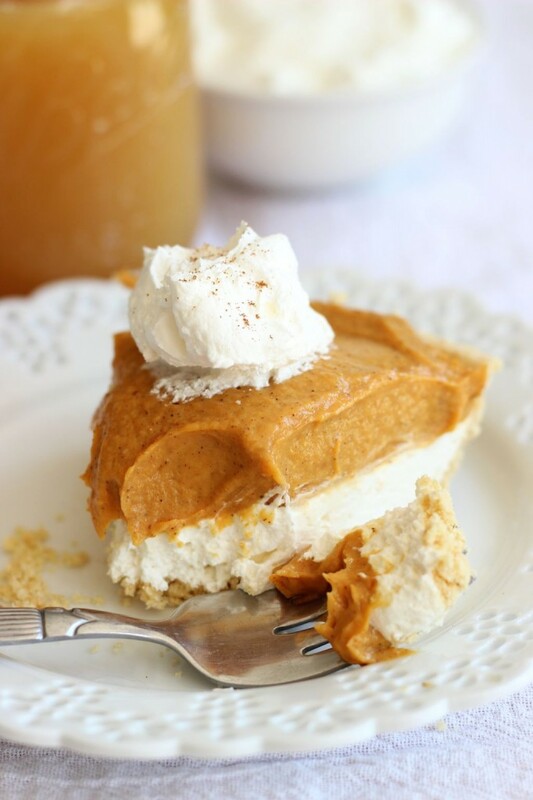 It gives just a hint of extra flavor and enhances the maple. 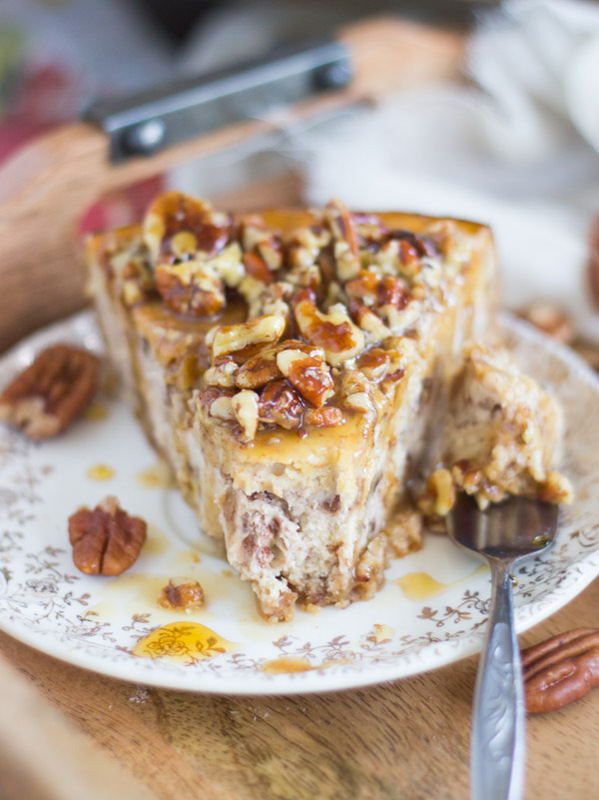 This Maple Nut Cheesecake is topped with a sweet and buttery maple-nut glaze. 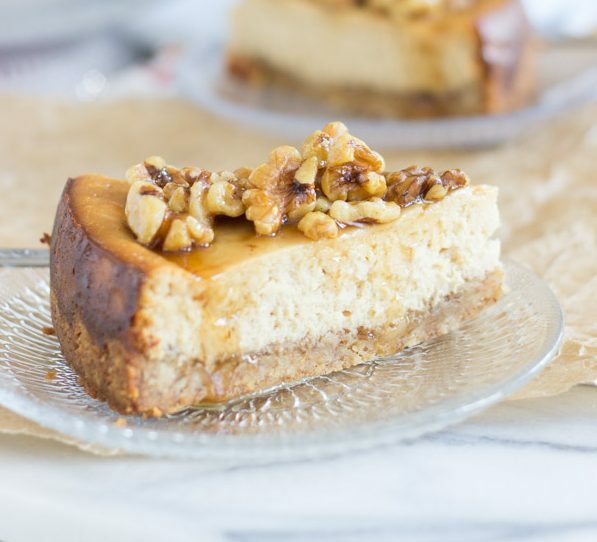 The glaze actually soaks into the cheesecake a little bit and it makes it all the sweeter and more flavorful, without detracting from the lovely texture of this creamy dessert. 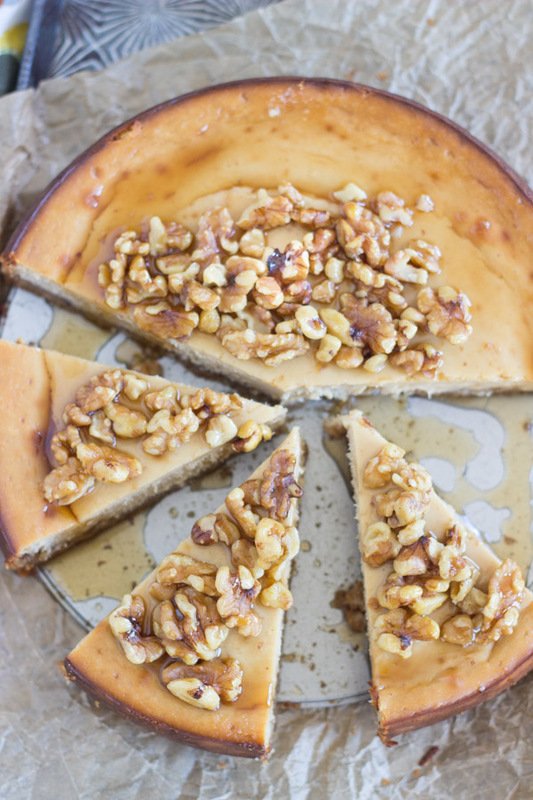 We are big fans of this Maple Nut Cheesecake, and I know you will be too. 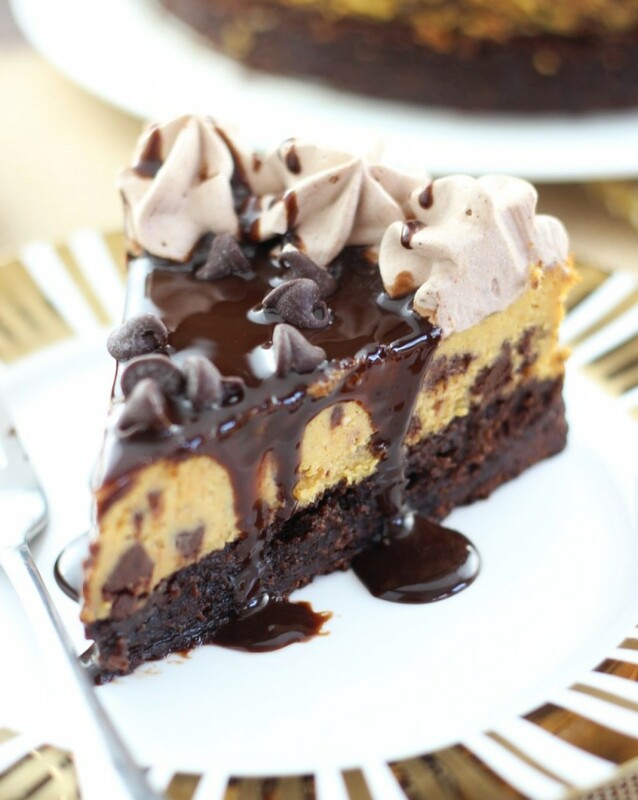 If you are looking for other cheesecake options, I’ve got loads, and I’ll share more ideas below! 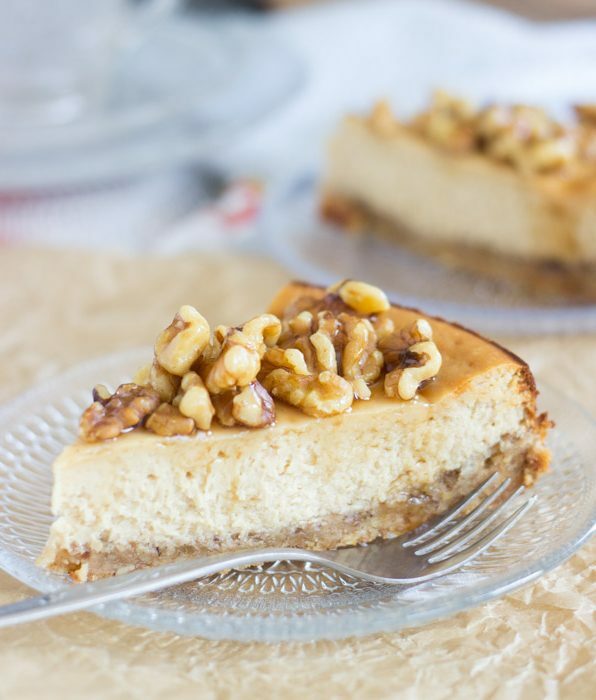 Creamy, rich maple cheesecake with a walnut shortbread crust, and a heaping maple-nut topping! In a small bowl, combine shortbread cookie crumbs, minced walnuts, sugar, and melted butter. Press into the bottom of an 8-inch springform pan. Add brown sugar, beating until combined. Add maple syrup and maple extract, beating until combined. Bake at 350 degrees for 45-55 minutes, or until edges are golden, and the center is still slightly jiggly, but almost set. In a small bowl, combine walnuts, maple syrup, and butter, tossing to coat. Spoon over the cooled cheesecake. Cut and serve. 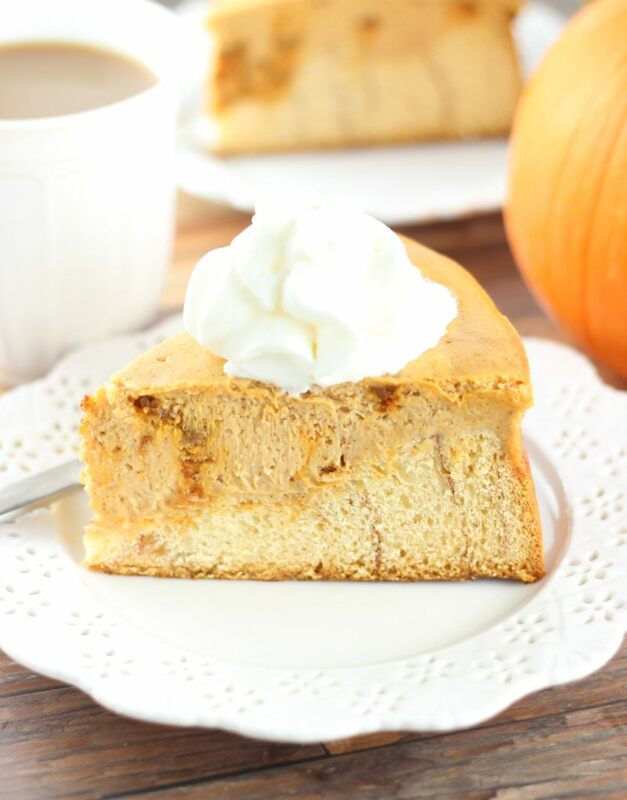 You may also like these fall and holiday cheesecakes! Mix the flour with the remaining sugar and add it and half the maple syrup to the cheese in thirds, mixing after each addition. Turn off the oven, leave the door halfway open and let the cheesecake cool in the oven for a half-hour. Perfect! Thank you for the tip! 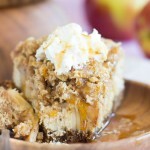 oh my, your recipes sound great, and I will try them out, but the reason I stumbled upon this site was googling for a shortbread/nut crust, and I do have a good recipe SOMEWHERE but thought it would be quicker to google. I was dismayed that yours included crumbled shortbread cookies, no doubt end result is good, but so easy to make from scratch, maybe even simpler and better, butter, flour, sugar, ground or chopped nuts, depending on your preference….. 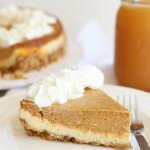 If you want my made from scratch recipe for this type crust, let me know, I will post it once I find it! Thanks for the recipes – looking forward to trying them! That’s a great point, Charmaine. I use lots of different kinds of pre-made cookies for crusts – Oreos, of course, but also gingersnaps, oatmeal cookies, Biscoff, and shortbread… but you make such a good point that it can be made from scratch! I MUST try that. I really appreciate your comment! You’re right – it’s probably super simple! Thank you, and happy New Year!